Kabir brings Alina home. Ayesha asks where were you? you didnt have any shame? Kabir stops her. Zeenat asks where is Zara? Zara comes there with Irfan and Salma. Kabir says today I know Zara’s truth. He holds Zara’s hand and says when my own person did wrong then how can I blame someone else? you believe in love marriages so much that you are provoking Alina to runaway? when your parents know of your deed then their trust will break like mine. Ayesha says Zara crossed all limits. Kabir says Amir called you and told you where he was with Alina. Zara says I didnt do anything. Kabir says I cant raise hand on Zara and Alina, he starts breaking bricks. Zara runs and puts hand under his, he stops before hurting her. Alina rushes to Kabir and says listen to me, forgive me, I did a mistake, I will never do it again. Kabir says you cheated us. Alina says nobody was listening to me, I dont want to marry Anas. Kabir shouts enough, love marriages are a sin, you proved it, ask Amir to never come infront of me. Alina says it was not Zara’s fault, I got a message from unknown number asking me to come to bus stand. Kabir checks message. Zeenat says Zara must have messaged her to put Kabir down. Zara says we all know what you did last days, we will know soon who messaged Alina. Zara says to family that you know me and blaming me like this? I just said that girls can marry with their choice. Ayesha asks Irfan to take their daughter away. Kabir says no, we dont know who sent that message, he asks Zara to stay away from Alina. Alina sits in her room and cries. She says Zara had to bear so much insult. Alina comes to Kabir. Kabir sits with her. Kabir says I am not your enemy, I love you a lot, I cant let you do this marriage, its a sin, I have to stop you from doing this sin. Alina says Zara is not at fault, I dont want anything. Zara comes there. Alina says I want your and Zara’s relation to mend, I can accept anything, Zara helped me, she told me to not run, she always did right thing for this house but you dont understand that. Alina says I will marry where you want for your and Zara’s happiness. Alina tears her nikah papers. Zara hugs Alina. Alina leaves. Kabir says she is on right path. Zara says forcing her is not her choice. Kabir says this is God’s will, dont teach me otherwise. Kabir calls Anas’s father and says we will do this marriage in two days. He ends call and tells Zara that we will never do love marriages. Zeenat comes to card store and orders Alina and Amir’s card. She calls Kashan and says I will send these cards to people, there will be two grooms for Alina and people will know that Irfan lied about nikah. PRECAP- Kabir says to Zara that you cant stop this marriage. Zara says I wont let Alina marry Anas. Kabir says you will go against your husband? Zara says I am stopping my husband from doing a sin. 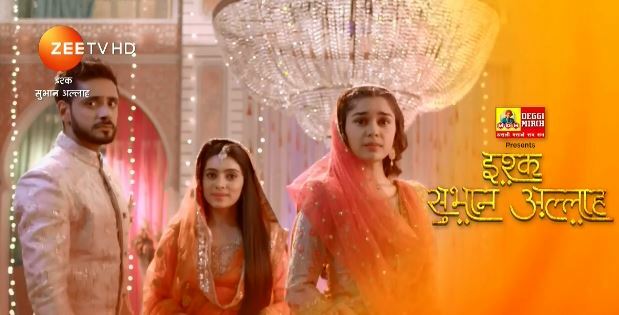 The post Ishq Subhan Allah 21st February 2019 Written Episode Update: Kabir blames Zara appeared first on Telly Updates.